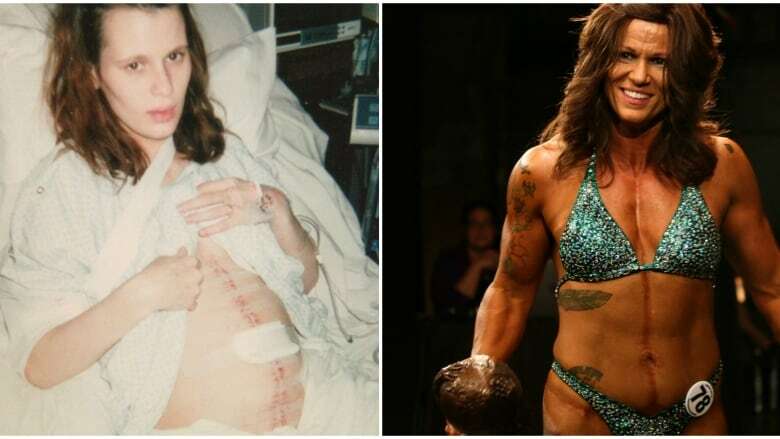 Tamara Brooks overcame a series of health challenges to finally compete in her first bodybuilding competition. The scars on her body tell the story of her life. Tamara Brooks had open heart surgery when she was six-years-old, and when she was 18, a family car ride ended in a terrible crash. "I lost most of my right lung, [my] kidneys went into the diaphragm and into the lung, I ruptured my bowels, I ruptured my kidney, I broke my ribs, five vertebrae — three in my back and two in my neck — were twisted, I tore my muscles in my back, tore my muscles in my stomach, tore my muscles in my right shoulder. I did almost a month on life support," she said. Brooks was six-and-a-half months pregnant at the time of the accident, and lost her daughter, who she had named Kimberly. Through physiotherapy, Brooks was able to heal the physical damage to her body. But the mental trauma from the accident, coupled with chronic pain from her injuries, took its toll. For a while she turned to alcohol to cope. In an effort to help, some of Brooks' friends suggested she try bodybuilding as a kind of therapy. That was eight years ago, and since then, she has completely transformed her body, scars and all. But in August of 2014, Brooks noticed a bald patch in her hair. She went to her doctor, who sent her to specialists. After ruling out cancer and skin disease she was diagnosed with alopecia universalis. Brooks learned she was going to lose all of her hair, including her eyebrows and eyelashes. "In the very beginning I think I cried about every day, from the time I woke up to the time I went to bed. I couldn't look in the mirror," she said. "I just kind of hid." After everything her body has been through, it's losing her hair that bothers her the most. "You lose your sense of identity. I feel like I'm invisible now. It's something that can't be fixed, like, you can hide your scars, how can you hide your face? You can't." Now that she's lost her hair, Brooks has a wig, but she doesn't like to wear it because she's worried about looking fake. It's only when she's at the gym working out that she can focus on something other than her looks. She works out three hours a day, seven days a week. "Being in the gym is the only place I can let go of what's going on with me and feel like I'm normal, because everybody at my gym totally accepts it, they don't look at me differently, they don't judge it." she said. "We make jokes about it. Like today we were talking about getting tattoos on my head like a bowling ball." After registering and backing out of Manitoba Amateur Bodybuilding Association competitions, Brooks decided that this was the year she was really going to overcome her fears. "Every year that I put it off, something else happened to me. So I figured if I do it again something else would happen, and I'd never compete. And also being 42, I don't want to be 45 by the time I get on that stage with all the work I do." In March of 2017 she competed, and came third in both her categories. She also won the Gorilla Jack Iron Will Award, which is awarded to people who have overcome adversity to compete. Her son and daughter were in the crowd to support her, and her daughter Shalyn Gagnon, couldn't have been prouder. "She's entered a couple of time but just fallen out, like gave up, right before because of her scars, but now she finally did it and her first year she won three awards, so there's so much more better to come, I'm so excited." FULL EPISODE: When you look in the mirror, do you wish something was different?